At Acucraft, there is always something interesting being designed, crafted, and built. Today we took to the shop floor to see what projects were being worked on at the different stations. This massive Custom Gas Outdoor See-Through Fireplace is currently being welded by our expert craftsman, Anthony. The viewing area for this fireplace is an impressive 144” wide and 36” tall. After manufacturing is completed, this fireplace will be finished with matte, black paint and internally tested to ANSI standards. This amazing fireplace will soon be complete with tempered glass, a firescreen, and a mammoth, 10-foot driftwood log set combined with lava rock. It will then be shipped to a future flagship store for Starbucks in Washington for all coffee lovers to enjoy. Shop Leader, John, is currently welding a custom, circular gas fireplace. This fireplace, or indoor fire pit, will be partially open with 12” tall protective, windscreen glass. The circular hood for the indoor fire pit will be installed above the open flames. This unique, indoor fire pit will bring the feeling of a bonfire indoors by presenting a gorgeous, camp fire log set in its center, combined with the tallest gas flames on the market. This fireplace will soon be manufactured, painted, internally tested to ANSI standards, and ready to be shipped to a residential home in Wisconsin. Our master welder, Pat, is in the beginning stages of manufacturing this four-sided gas fireplace. This open fireplace will not have glass but will be accompanied with a firescreen on all sides. The front and back viewing areas measure 70” wide 26” tall. The sides are 46” wide and 26” tall. This outdoor fire feature’s base has been designed and is being built to fit into an already existing masonry structure. After manufacturing is complete, this model will be painted with matte, black paint, internally tested to ANSI standards, and then shipped off to an outlet mall in Illinois! Our finishing specialist, Rob, is putting the final touches on a Hearthroom Wood Fireplace. Our optional Patina finish is applied using a 200-year-old recipe and technique. By heating the fronts and doors in an oven, spraying on the special mixture, and repeating the process several times, you produce a gorgeous coloring in the metal that will last a lifetime. After the patina is complete, this fireplace with a beautiful Japanese Brown Patina and Forged Design will be ready for its new home! This Custom Gas Outdoor Fireplace is getting ready to go into the paint booth! This large fireplace is 92.5” wide, 44.5” tall, and 36” deep and is going to be shipped with an incredible 60” gas log set combined with lava rock. The stainless-steel burner and grate for the log set is over 200 pounds alone! After this fireplace is painted with matte, black paint, it will be internally tested for quality and safety to ANSI standards. It will then be shipped off to Denver, CO to be the centerpiece for an outdoor space at an outlet mall. This residential gas fireplace was just painted and is waiting to be tested. Open on all sides with no glass, this will be an awe-inspiring fire feature for its future residential home. This fireplace has a front and back viewing area that measures 70” wide and 26” tall and side viewing areas that are 46” wide and 26” tall. This built-tough fireplace was designed and built to withstand an impressive amount of real, masonry stonework. A large, gas log set will be enjoyed from every angle. After being internally tested to ANSI standards, it will be shipped off to Wisconsin! Our Testing Coordinator, Marshall, is getting ready to test this residential gas fireplace to ANSI standards. This custom, open, linear fireplace is designed with a 96” wide and 30” tall front viewing area and 24” wide by 30” tall right side viewing area. It will be complete with glass media and stones, a firescreen, and no front glass. After testing is complete, this gorgeous fireplace will be shipped off to Washington to be enjoyed for years to come! This custom wood fireplace is going to create the ultimate romantic atmosphere for a master bedroom. This unique, linear fireplace has a viewing area that is 58” wide and 22” tall. This custom model is prepared to burn almost 4-foot logs for a burn that will be enjoyed without obstructions. It is coming standard with our gas knockout, which is used to convert a wood fireplace into a gas fireplace, if desired in the future. This model is ready to ship off to a home in Pebble Beach, California. We love when clients or potential clients come to visit our shop and see what new fire products we are working on. We don’t have a showroom, but you can experience awesome fireplaces being built right before your eyes! If you are interested in visiting us, we are located in Big Lake, MN. There is always something new and exciting being designed and built at Acucraft. Call today to meet with your Fireplace Advisor and Designer, take a tour through the shop, and brainstorm your own fireplace dreams! This year, the popular ABC series The Bachelor ran a four-episode spin-off of the show that ran in conjunction with the Winter Olympics. “The Bachelor Winter Games” is an international couple competition that had the perfect setting: a snowy Vermont ski resort called the Hermitage Club. The Hermitage Club is a luxurious 1,400-acre community of private residences located in the Green Mountains. Here, the contestants were able to go hot-tubbing, snow tubing, and, of course, skiing. Amongst the gorgeous snow drifted hills sits the main clubhouse of the Hermitage Club where the infamous Rose Ceremony of “The Bachelor Winter Games” took place. 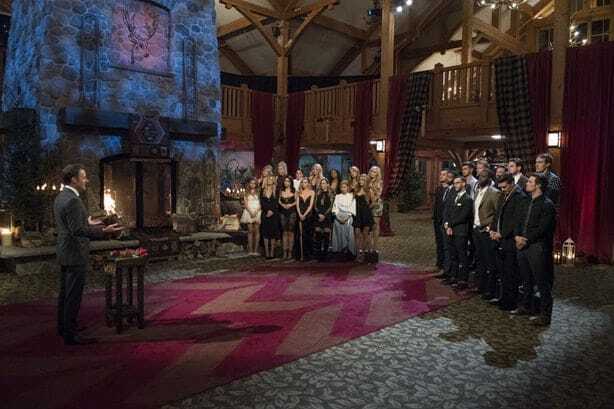 All the contestants stood anxiously in front of the largest wood burning fireplace in Vermont. This impressive, four-sided, gorgeous fireplace was the settings’ focal point for the finale of the spin-off. This amazing fireplace is the perfect centerpiece to mirror this over-the-top ski resort. With massive doors on all sides that stand over 5’ tall and 5’ wide, this fireplace was sure to leave an impression on even the most discerning couples. The crackling from 10’ logs burning inside set the perfect romantic atmosphere for the Rose Ceremony. And, although many other spaces that were used to film the hit show were redecorated to the point of being nearly unrecognizable, the main lodge where the fireplace is featured remained essentially untouched. Save for a few Winter-Olympic-style lighting features. Although the roses have been given to the winning couple and the camera crews have since cleared out, you can relive your guilty pleasure by spending the weekend at the now-famous resort yourself! Sit at the bar where the stars from The Winter Games drank the Hermitage’s signature cocktails. Ski the immaculate snow slopes of the Vermont mountains. Or, reenact your own Rose Ceremony with the love of your life in front of the gorgeous Acucraft custom wood fireplace. Create your romantic setting with your own custom wood fireplace! Request your Wood Burning Fireplace Catalog to learn more information.